Finmeccanica's purchase of helicopter maker AgustaWestland has been given the go-ahead by the UK government. Engineering group GKN is selling its 50% holding in the group to its Italian partner for £1.06bn ($1.89bn). Ministers said the government had ruled out a Competition Commission investigation into the sale. The move spells the end of UK ownership in the helicopter industry, which is now dominated by players such as Bell, Sikorsky, Boeing and Eurocopter. 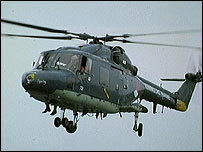 Somerset-based AgustaWestland was formed in 2001 from the merger of the two firm's respective helicopter businesses. UK competition minister Gerry Sutcliffe said Finmeccanica and GKN would have to agree to protect sensitive data and pledge that future production for the UK military stays under control of a British-registered firm.